She was blown away. She was stunned, ’cause it was nothing like what she had been led to believe or thought, combination of led to believe or thought on her own. Is that pretty much accurate? Did she say she was gonna start listening now? Blown away. Look, it’s 29 years. I guess false impressions and images have a long life span. But I’ve run into a couple of reactions, not from the actual people who had them, people like you telling me that they knew people who of course knew who I am. I’m almost too famous to go on TV, to tell you the truth. And they know of me, but they don’t know me, and they watched it, and they were stunned. Isn’t 29 years long enough to learn the truth about anybody? 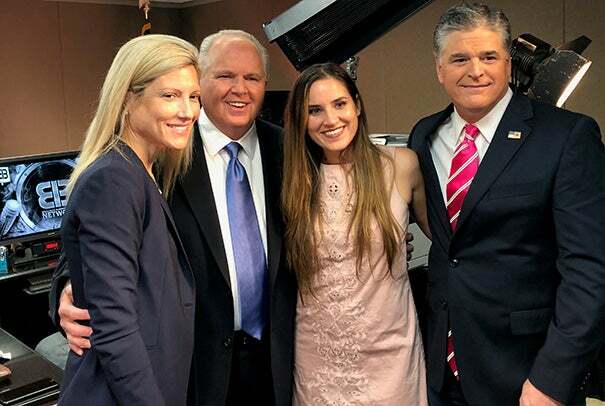 RUSH: I was gonna do this first thing out of the box here, but the event and incident in Las Vegas sidetracked me, but I wanted to take a moment here and thank from the bottom of my heart Sean Hannity. He was here, his whole crew was in here last Thursday and they were here for about an hour and a half. And everybody, kind of like a reunion, the commie babe makeup artist from my TV show, Debra, was here. And my niece who is on Sean’s staff and, as he says, is a — well, she’s just knocking it out of the park, he says, and we’re all so appreciative of that. But the things that he said about me during the course of that interview I didn’t realize at all ’til I was watching it. When you’re in the middle of being interviewed, you’re aware of it, but your attention’s all, “Okay, where is this going? What’s the question from this gonna be?” And it wasn’t ’til I watched it on Friday night and noted how overwhelmingly well he treated me, I’m not used to it. I’m not used to all of the nice things that he said, and I just wanted to take a moment here and offer a sincere thank you to Sean personally and to the whole Fox crew that were here. Now, people have asked about the ratings. You know, folks, I’m not the one to tell you. But they were really, really, really good. Sean’s average total audience — I don’t think this counts DVD replay, DVR, I’m not sure. I think it’s the live audience for the 9 o’clock show. Might be including the midnight replay, but I don’t think so. His average audience for the week was 3.4 million, and Thursday night we had 3.75 million. It was the top night of the week. I don’t know what Friday’s numbers were. The week is considered Monday-Thursday because Friday is not a school night, as they say, people are out and about, smoking weed, getting drunk, debauchery and that kind of stuff, not at home as much. But it was good. Everything about it was just first class and it was enjoyable and it was fun, and I just wanted to offer sincere thanks to Sean. He said some incredibly supportive and nice things. Yes, they had the added benefit of being true, and they are never said. Snerdley sitting here coaching me on what to say. “Yeah, nobody ever says it, either.” Except Sean did. That’s the point. So I think it exceeded — I don’t know what expectations were ratings-wise, but I think it exceeded them. It was the high for the week, which everybody’s gratified by it. I don’t know if you can tell, but I’m kind of a little nervous being the one to say so. It’s been published, but in trade publications. And in the trade publications they acknowledge, they can’t ignore that I was there, but that’s about as far as they go, ’cause in the trade they’re not happy with the result. They’re not happy with Hannity being number one over MSNBC, and they’re really not happy that I had anything to do with it, to whatever even small degree.